Dr Webber offers the All-On-4™ dental implant system which involves the permanent replacement of dentition(teeth) or a denture with a fixed prosthesis/bridge. 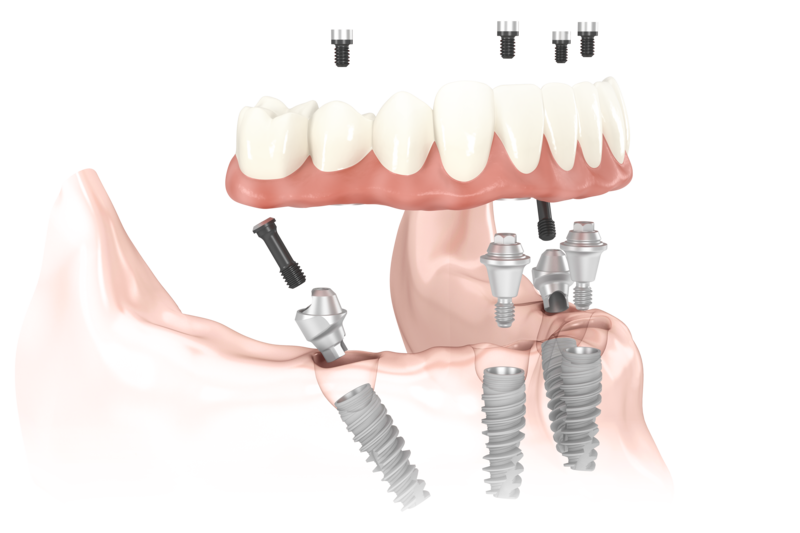 The term ‘ALL-ON-4™’ refers to replacing ALL teeth by inserting FOUR dental implants into the top, bottom or both jaws. The four implants provide the necessary support of the prosthesis, allowing a thin, streamlined denture to be fixed into place (not removable). It is a modern technique where the back implants are carefully placed and tilted 45º to provide the required support for the total rehabilitation of a dental arch. By tilting the back implants, it overcomes the bone deficiencies often found in these regions plus, avoids adverse anatomical structures and, usually, the need for bone grafting. This treatment is commonly referred to as "teeth in a day" as the aim is to fix the customised, streamlined denture into place the same day as the implant surgery. Dr Webber's high level of skill and expertise has enabled him to become a leader in the field of placing implants to help retain and stabilise dentures on the same day as the implants are placed. Dr Webber can work with your dentist or denture specialist in order to complete the treatment within 24 hours. It is usually, but not always, performed with the patient asleep under a general anaesthetic. Patients with terminal or non-restorable dentition can have all their teeth removed and the implants placed immediately in order to gain the exact same end-result (non-removable denture) within 24 hours. Single tooth extraction and immediate dental implant placement also allows patients' to have a "tooth in a day". When you attend for a consultation with Dr Webber you will be examined both clinically and radiologically. A special 3D cone beam image will be taken to scan your jaw and assess your suitability for the procedure. Once this stage is completed a comprehensive treatment plan can be compiled to formulate the most suitable treatment plan for you. Click here for post-operative instructions. If there is not enough bone in the top jaw to place four conventional implants, the All on 4™ scenario can still be made possible by placing one or more zygomatic implants in combination with conventional implants. Zygomatic implants are anchored into the cheekbone, and, when there is absolutely no bone in the anterior upper jaw, four zygomatic implants are commonly used. This procedure is referred to as Quad Zygomatic Implants. The end result is a denture can be permanently fixed into place and the treatment still completed within 24 hours; "teeth in a day". Only Oral and Maxillofacial Surgeons have the training and skill necessary to carry out this alternative surgical option. The surgery occurs under a general anaesthetic and Dr Webber will work with your dental specialist immediately post-operatively to provide a fixed, streamlined denture which is secured to the zygomatic implants. Please contact us to schedule a consultation appointment with Dr Webber or for further information. 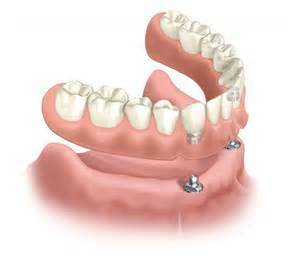 An overdenture is a removable complete denture that is supported by implants. They are suitable for edentulous patients, or patient's who do not have any remaining teeth in one or both arches. The effect of overdentures is to provide greater stability so that dentures behave much more like normal teeth. The biting pressure can be taken off the gums and directed into the bone like natural teeth. Overdentures are a good solution for patients who have trouble keeping their dentures in place, particularly the bottom denture. Because they hold the dentures in so tightly they remove the necessity of using adhesives. The dentures can still be easily removed for cleaning. The most important health benefit of an overdenture is the prevention of bone loss, as the implant overdenture strengthens the bone structure. Of course, dentures also look nicer than a mouth of gums and no teeth. The patient also experiences a much easier time talking and eating with overdentures. If inserted properly, an overdenture should align the jaws accurately and restore 90 percent of chewing power to the patient. Dr Webber can perform the surgery under local or general anaesthetic. He will work with your restoring dentist or specialist, or dental technician, to achieve the most optimal aesthetic and functional outcome with the most minimal intervention required. Please click on the link to view Implant Overdenture case studies.